August has become the month of rum for me and I have a handful of libations for your late summer indulgence. 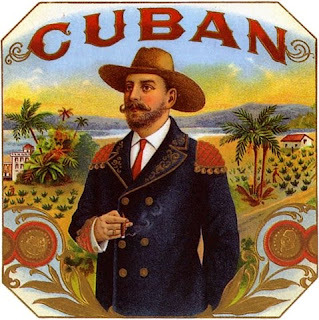 The first of which is the Old Cuban. Think of this as a more sophisticated mojito, a drink fit for a heavily compensated leader of a banana republic. The true origin of this drink is much less romantic so I prefer to let my imagination wander to simpler times when the shady politicians and unscrupulous businessmen plied their trades with little government intervention and the world was none the wiser. The drink actually originated recently by Audrey Saunders of the Pegu Club in New York, not to be confused with this Pegu Club. It has the complex flavor balance of other vintage cocktails we have sampled and deserves a place among the old classics. Start with ¾ ounce of fresh lime juice, ¾ ounce of pure cane simple syrup and six small to medium sized mint leaves in a cocktail shaker, muddle. Fill the shaker with ice, add two ounces of an aged dark rum, I like Cruzan. Top it off with a couple dashes of Angostura bitters and shake. Pour the mixture into a chilled cocktail glass and top it off with chilled Champagne, approximately 1 ½ to 2 ounces. For your first sip, close your eyes and imagine yourself as a United Fruit Company executive hopping around Central America on a Pan Am Clipper. Muddle lime juice, syrup and mint in a cocktail shaker. Fill with ice; add rum and bitters, shake vigorously. Pour into a cocktail glass and top with champagne.